A postcard in the Ethel McLean Johnson papers that reads on the back, "June 20, 1915, Dear Little Florence, I didn't have a Birthday card so I will send you these pink roses to smell of. We would like to see you. Edith sends a kiss. From Grandpa and Grandma." 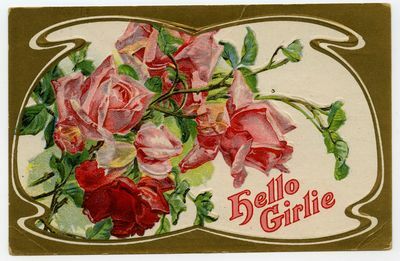 Printed text on the front reads, "Hello Girlie." No address or postmark.